Abstract: Virtual Device is an add-on software package to SIMION 7/8.0/8.1 and future versions. It covers several features not fully developed in SIMION such as graphical geometry (GEM) building, data analysis, and ion movement in a gas. Virtual Device was developed independently by SIMION user Dr. Sergei Koltsov, St. Petersburg Russia (HSE-Saint Petersburg). Build geometry (GEM) files graphically. Optional hydrodynamics version: Navier-Stokes gas flow solver for supersonic, compressible, invicid flow conditions (e.g. supersonic jet), explorting gas flow, pressure, density, temperature, and velocity PA's into a SIMION collision model. Click to download above PDF poster. 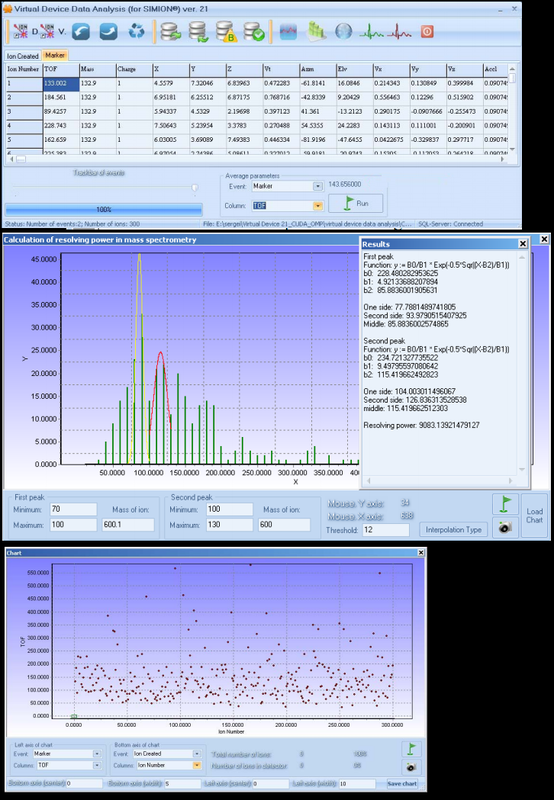 Data Analysis can load SIMION Data Recording results and perform various plotting and analysis functions, some of which are specific to mass spectrometry. A more advanced version of Virtual Device is also available that supports the flow calculation and simulation of ion movement in a supersonic jet. See Virtual Device 21 Hydrodynamic Version. Last note: the official user of version 18 will get the next version for free. I am planning to support a new features of SIMION 8 in Virtual Device version 19. I would like to present a fresh version of Virtual Device. It is version 16. I am glad that my software is already used by above 100 people from different countries. Thanks for your suggestions and remarks. Version 16 is the last version which is for free. I also continue to work on the next version. What will be in next versions. First of all, I will add the possibility to create 3D geometries of spheres/half spheres and grid as a single object. I also add the possibility to create the 3D geometry of any axial symmetry system. If you a have text file with two columns, which describes the shape of electrodes, you can recreate these electrodes as a 3D geometry in my software and of course transform these electrodes into SIMION. This feature is very important for scientists who deal with the simulation of energy analyzers. One of the main problems in the simulation of energy analyzers is the problem of electrode shape. If you like to prove the resolution you need to change the shape of the analyzer. By using my software you can do this very easy and quickly. The other direction of my software is connected to the simulation of ion movement in special gas flow. The main problem is in arranging the description of gas flow in SIMION. Many articles devoted to this problem are addressed to a resting gas. But if you like to simulate supersonic gas in some 3D geometry, what are you going to do? I see only one way. You will try to simulate gas flow in some CFD software and then transform the results of the simulation to a SIMION PRG file. But, does commercial software actually give correct results? I just checked CosmosFlowWorks and 3D Flow. Both of them give completely wrong results for a supersonic jet. I would like to remind that one of main directions in mass-spectrometry is the investigation of the ESI source and coupling this source to mass-spectrometer. The simulation of ion movement in different pressure regions is one of problems of such coupling. Therefore, I developed my own software, which simulates gas flow in 3D geometry in Virtual Device. The results of the simulation are arrays of pressure, density, temperature, and velocity distribution of gas in a 3D geometry. This geometry can be easily transformed to a SIMION geometry, and the user can use those arrays in a PRG file. I like to stress that my CFD software is tested with experimental results, which is of course very important. Therefore simulation of gas-dynamics task in SIMION becomes very simple. When I started to work with SIMION I found that SIMION does not cover two main parts. First of all, if you like to create a very complicated geometry, you have to write a program in the SIMION GEM language. In principle, it is not a problem for people who have experience in making these programs, but for others it can be difficult. Moreover, if you have a complicated project and you need to change some things in the project, for example to move positions of many pieces, you need to change data in GEM file. Obviously it is not convenient. The second problem is following: Actually people are interesting not only in trajectories, but also in some information that can be obtained from results of a calculation. SIMION does not cover the possibility of analyzing of results. The user has to write own software or use some standard software like Sigmaplot or Excel. Now, I would like to introduce my own software, which partially covers both problems. It has several parts. The first one is a kind of CAD program. You have a list of standard parts: box, cylinder, tube, solid cone, solid cone with hole, box with hole, box with split, ideal plane grid, segment, cross, and ideal conical grid. You can create a complicated plane by choosing elements from the list. You can change sizes of your parts or remove a number of parts very easy. When you have created your 3D project, you just need to press a button, and my program will create the 3D geometry file in the SIMION language (GEM). 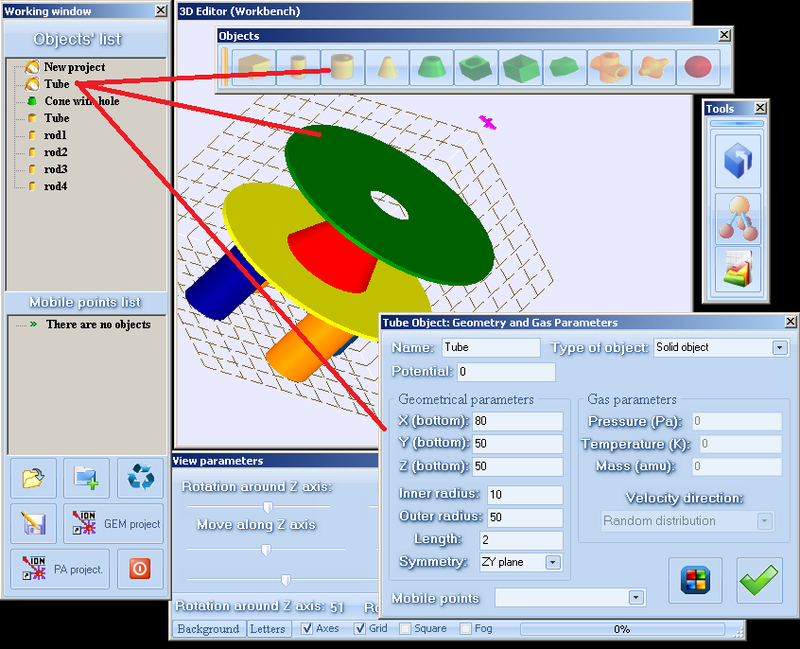 You can resize the project, and you can create a library of your standard parts and use them in new projects. For example, to create an orthogonal TOF (time of flight mass analyzer) with a system of lenses inside of cross chamber with flanges, I have spent about 1 hour. How many hours do you spend to create such project? After doing the calculation you need to get some important information from the SIMION data. You can quickly generate standard information (in a picture) like ion distribution in different plane, ion distribution in phase space, a plot of time of flight versus energy, time of flight versus m/z, calculate ions intensity and resolving power for TOF. All data is stored in the grid; therefore, you can plot any column versus any column. Some times, people need to transform exit ion data to entrance data. For example, you stopped your ions at some position and got some information. Now you like to continue to run ions from the last position. You can do that just by pressing one button. You can set up position of acceptance and the program calculates how many ions in the acceptance. You can also set up the position of the detector (it is just a rectangle) and the program will give number ions in the rectangle. You can also filter your SIMION data. For my own work, I did additional things like creating a special ion distribution. Of course, SIMION has own possibility to do it, but sometimes it is difficult to use. For example, it is not easy to create a disk of ions (cross, or crossing many lines), or ions which has Gaussian distribution in energy in SIMION. You can do it by pressing several buttons in my program. At that moment, program is for free. I like to share my knowledge with other people. 2012-04-25 - version 21.1 demo version available. This version is simpler to use and faster (does not require SQL server anymore). NEWS! 25 April 2012 - New v21.1 demo version available. 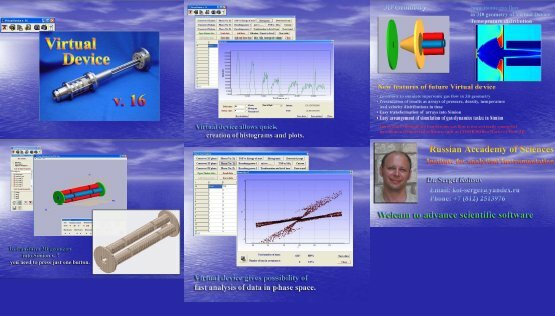 Demo version: You can download a demo version of Virtual Device Hydrodynamics from the "Check for Updates" button on main screen of the SIMION 8.0 or 8.1 software. (If you do not have SIMION but want to demo the hydrodynamics version, e-mail us, asking for the demo.) You may use the Demo version for about one month for the purpose of testing the software (non-production work). If you're interested in gas flow calculations, be sure to see the Quick Tour of the Virtual Device Demo. Details on the latest version 21 Light are described in the online manuals above. People who have purchased Virtual Device 18 are entitled to a free upgrade to Virtual Device 21 Light. Click the "Check for Updates" button in SIMION 8.0 or 8.1 to download the Virtual Device update. DISCLAIMER: Virtual Device is developed independently Dr. Sergei Koltsov, not by SIS. SIS occasionally tests Virtual Device and has found it very functional, but SIS makes no warranty or guarantees. Sergei has extensive experience in SIMION and is a SIMION consultant.